1. Ka'Deem Carey: Carey is the best running back in the nation, hands down. He possesses the three most important traits that all of the greats have: burst, vision, and durability. If you'd like to check out any game film of his that demonstrates Carey's rushing prowess, take a look at the Oregon game film. he carried the ball 48 times en route to a 206 yard and 4 TD performance to upset the #5 team in the country. The average of 4.3 ypc during that game may seem pedestrian in the day of explosive running backs in college football; however, Carey brought the fight on every single carry. Towards the end of the game, when it seemed as though the most valuable player of a decent Arizona Wildcat's team should have been resting on the bench, Carey bullied Oregon defenders who were ready to say goodbye to any hope of winning the PAC 12. I understand that Ka'Deem will not be found at the top of many lists for collegiate running backs due to a lack of west coast coverage; however, his career at Arizona is chock full of marquee moments. He has been Mr. Consistency, rushing for 100+ yards in his past 16 games and rushing over 100+ yards in 22 of 25 games these past two seasons. Has he missed a game due to injury? Not yet (knock on wood). If he indeed does declare for the NFL draft, his last season at Arizona was a quality one as he was the reason for most of their wins, finishing with 1885 yards, 19 TDs, and an excellent rushing performance in the Advocare V100 Bowl at Independence Stadium with 169 yards and 2 TDs over Boston College and their Doak Walker winner in Andre Williams. I think he should be the first running back drafted and when NFL GMs watch his game film, he will be the first, taken early in the draft. A late 1st round pick or a 2nd round pick seems to be fair for the Arizona record breaker who can be a durable, consistent workhorse in the NFL. 2. 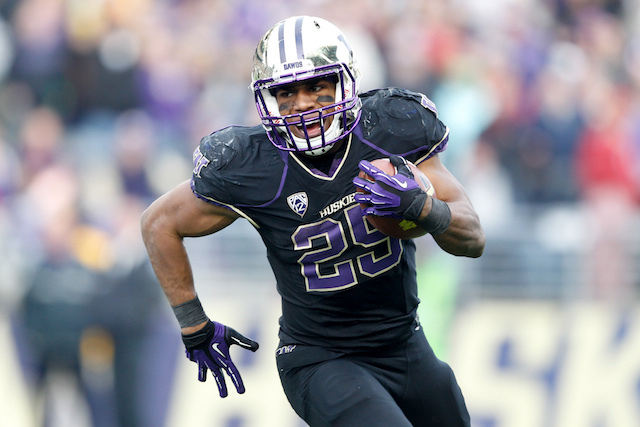 Bishop Sankey: Being the second best running back is good enough to be the second best running back in the nation. That is how strong the PAC 12 is. Sankey, who has already declared for the NFL draft, was actually considered the better PAC 12 running back by many during the early stages of the season by both educated and uneducated fans. Smarter fans mentioned that he had a greater knack for the home run play than Carey while some east coast analysts and lesser watched fans took to the stat sheet to say that Sankey was the better running back. Now that both Sankey and Carey's seasons are over, Ka'Deem has eclipsed Sankey while playing one fewer game. However, 1870 yards is nothing to scoff at, and I hope NFL scouts will watch Sankey's game film against some of the better defenses. He has lacked consistency, with a terrible 22 yard rushing performance against Arizona State, but he also demonstrated a level of vision and explosiveness similar to Carey's against great defenses in Stanford and BYU. I expect Sankey to be drafted in the 3rd round and if he is taken by a team with a solid O-line, he is going to enjoy his fair share of success at the next level. 3. Carlos Hyde: Hyde is an absolute beast. When I watched him play this season, he reminded me a lot about Chris "Beanie" Wells, a former 1st round Buckeye. I think when all is said and done, he will be a much better running back than Beanie Wells was in the NFL (not that that says much). Through 10 games, he has rushed for 1408 yards this season with 7.7 ypc. That rushing stat line is made even more impressive when you realize that Hyde is not a lil fellow who likes to take the ball on the edge to run. No, he is a bruiser in a stout 6'0", 242 lbs build. He also has excellent balance and speed for a big man, which has given him a knack for finding the end zone. Just take a look at his #SCtop10 run against the Iowa Hawkeyes. I have never seen a big man with as much body control as he displays in that play. Having Braxton Miller as his QB serves as a nice distraction as teams focus on stopping the QB running game as well as Hyde's own; however, you could very well make the argument that Hyde could have more yardage if his team relied on him more. All in all, I think he is strong and durable enough to become a solid running back in the NFL. I expect him to be drafted in the 2nd or 3rd round. Whoever drafts him will have to take some time to clear up his troubled background, but I think he has greatly matured this season. 4. Tre Mason: Mason is a big play running back. He's extremely explosive and produces with the big play. However, I wouldn't take him over the other two RBs in front of him because I think many of his yards can be credited to the scheme that Auburn runs. With a dangerous running QB in Nick Marshall in Gus Malzahn's clever and sneaky offense, a lot of attention is drawn away from Mason on each individual play. With 128 attempts for 848 yards, more than half of his 1621 yards on 283 attempts came when the game's margin was 15+ points, meaning that Mason runs wild when the game is not close. Putting up as many yards as he has in the SEC is impressive, but it's not as impressive when you take the yardage you should be able to take on the ground against lesser teams such as Western Carolina and Florida Atlantic. It'll be very interesting to see how he'll run against Florida State's defense on January 6th. If he can earn big play yardage against Florida Sate, he would prove his explosiveness against a top defense and cement himself a title as an explosive pro prospect. As it is now, I expect him to be drafted in the 2nd round, but used as a third down back in his first season. 5. Andre Williams: People on the east coast may trash me for putting the Boston College product, but I am by no means biased against him. After all, I almost went to Boston College High School. I have a great respect for the university, it's football program, it's head coach Steve Addazio, and it's MVP Andre Williams. However, if you take away his rushing performances against NM State, Maryland, and NC State, all of which possess a mediocre defense, then Williams wouldn't have enjoyed the 897 yard spurt to his 2177 yard total that really catapulted the hype he received late in the regular season. With a hot streak entering a regular season finale against Syracuse, Williams was stonewalled and injured by the Orange defense. With time to get healthy after receiving his Doak Walker Award, Williams was stoned again by a sub-par Arizona Wildcats' defense in the Advocare V100 Bowl to end his collegiate career. I think I speak for many when I say college football appreciated Andre Williams' senior campaign. His story is an excellent one meant for the story books as he has demonstrated determination in his rise on BC's depth chart and on the field as a physical running back. I think he will enjoy some success in the NFL as a short-yardage running back, taken in the 3rd round.